About twenty years ago, I gave a friend an evening of her choice as a birthday present. She wanted to go swimming and later have Indian food. I had never had Indian food before and the evening turned into a revelation. It was so good! We had bhatura (fried bread), Saag Aloo (spinach with potatoes) and malai kofta (lotusroot „meatballs“ in creamy gravy), mango lassi and yogi tea. Where have these things been all my life? I was the one who got a present! Ten years later, when I decided to ditch dairy products, Indian food became a little difficult, as it is mostly prepared with ghee and has tons of cream, milk and yogurt. Many Indian restaurants do offer vegan dishes, but also I have learned to cook my own indian food. 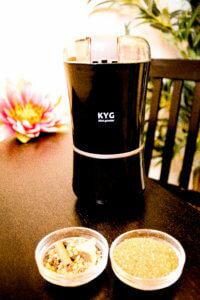 The blog Vegan Richa and her cookbook* were super helpful. Before I read this book, which also offers a good introduction to the indian cuisine and it’s ingredients, and delivers recipes for the classics, my Indian food always tasted somehow German. What are they doing differently, I always wondered. Richa’s book gave me a good tip. Ground spices lose their aroma quickly, it’s better to buy whole spices and only grind an amount that you can use up soon. I threw away my ancient garam masala powder and got a bag of whole garam masala*, that I grind freshly into my food with my electric spice grinder*. For me it makes all the difference! Just like Richa I am a big fan of fusion kitchen, but of course you need to know the rules to play around with them. So I am working my way through the classics now: naan, seitan makhani, samosas etc. Indian cuisine has started to sneak into my recipes a little already though: ajowan works great in my sweet potato focaccia. 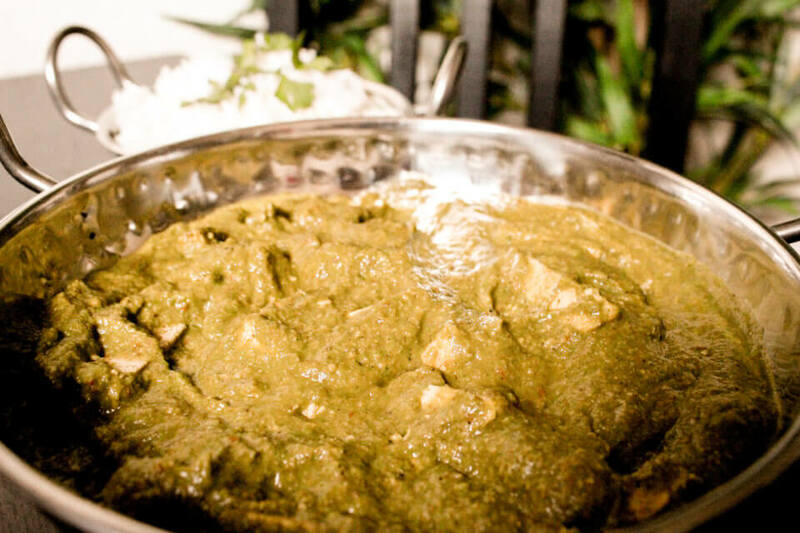 One of my favourite dishes has always been palak paneer, a spinach curry with Indian cheese. This became palak tofu paneer. 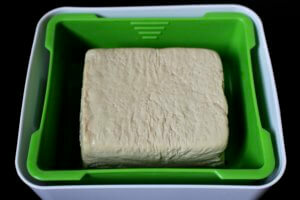 I recommend using a tofu press for this dish, it not only creates a much more paneer-like texture, it also makes the tofu absorb the spices better. 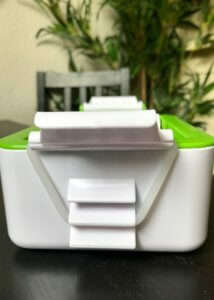 Whenever I cook palak tofu paneer, I put the tofu into my tofu press* about two hours before -it’s super easy, just put it in, close the lid and fasten the rubber bands – and I also soak the cashews for the curry sauce while I’m at it. 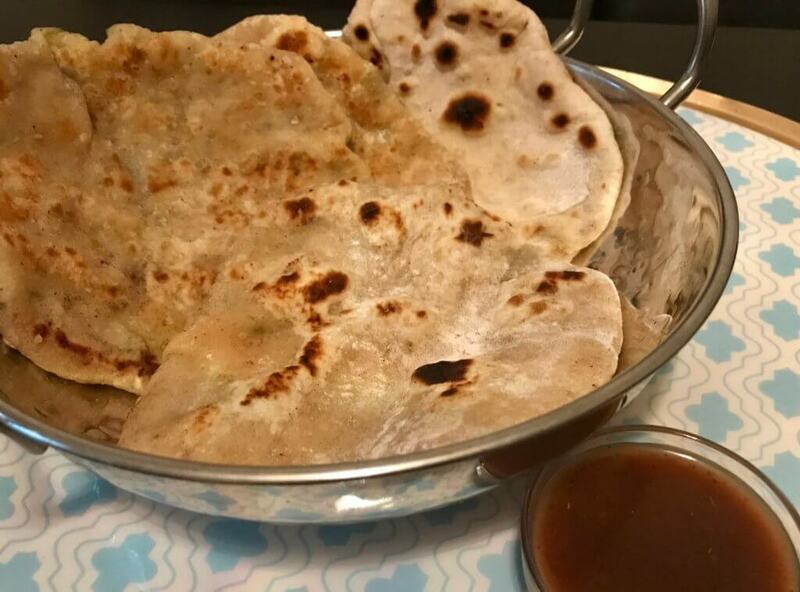 I serve it with paratha, that is a stuffed bread, with potatoes for example, and the tamarind chutney from this recipe tastes amazing with it. 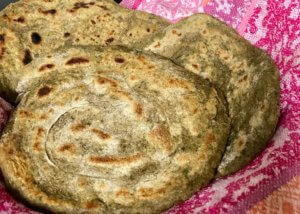 Spinach paratha is also great (picture below). They are best served warm and make perfect sides for any Indian food. This is the first time I bought a cookbook for my kindle, but that did unfortunately not really convince me. As much as I love my kindle and take it everywhere, in a cookbook I want to stick post-its with notes. I also don’t want to touch the kindle with my sticky food fingers, while a cookbook is allowed to look like it’s been used for cooking. So my next cookbook is going to be a physical one again. Or what is your experience? Tell me in the comments! I picked and bought all these products myself, this is not a sponsored post.